H. Torczyner, Ren Magritte: signes et images, Paris, 1977, p. 116, no. 189 (illustrated). D. Sylvester, S. Whitfield and M. Raeburn, Ren Magritte, Catalogue Raisonn, London, 1993, vol. III (Oil Paintings, Objects and Bronzes 1949-1967), p. 362 (illustrated, fig. a). Les Gots et les couleurs and the subsequent oil of the same title were Magritte's third variation on the curtain picture La Joconde of 1960 (Sylvester, no. 922; private collection), and continue a theme which he had been actively exploring since that year. However, the specific elements out of which the curtains are made--fire, forest, sky, and a house--date back to a much earlier period, and are found in Le Masque vide, 1928 (Sylvester, no. 285; coll. National Museum of Wales), Les six lments, 1929 (Sylvester, no. 321; coll. Philadelphia Museum of Art), and Au Seuil de la libert, 1930 (Sylvester, no. 326; coll. Museum Boymans-van Beuningen, Rotterdam). 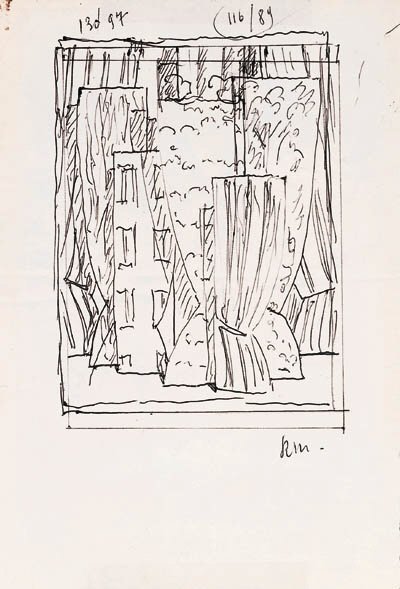 Magritte, in a letter to Andr Bosmans dated 24 April 1962, made clear that to him the curtains were not to represent the "idea of hiding" but instead are that which hides (quoted in D. Sylvester et al., op. cit., p. 362). In fact, they almost appear to the viewer to be revealing the elements out of which they are made, and address the idea of duality which is at the core of many of Magritte's works. "It will be an assembly of curtains, one 'as sky,' another 'as fire,' another 'as forest' and another 'as house,'" Magritte wrote Bosmans in 1962. "They will appear against a dark background. Tastes and Colors seems to me to be a good title for this image..." (quoted in ibid., p. 361). It is possible, as Sylvester has noted, that the title alludes to the French proverb "Des gots et des couleurs, on ne dispute point" ("You can't argue about tastes and colors"); perhaps Magritte is commenting on the arbitrary nature of personal experience.